Doctors at Hanoi's Bach Mai Hospital had successfully saved a 650g baby from a woman who was suffering from high blood pressure, said Dr. Nguyen Tien Dung, head of the pediatrics department last Tuesday. Previously, the baby's mother, Nguyen Thi Kha (43 years old) was taken to the National Hospital of Obstetrics and Gynecology when she was pregnant for 25 weeks. 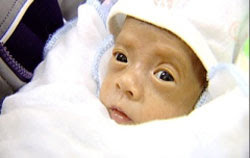 To protect the baby’s life, doctors decided to operate on Kha and take out her 28 week-old daughter on November 22. Originally posted on February 9, 2012.